The XMRV virus - what is it? Chronic Fatigue Syndrome and Fibromyalgia have been largely dismissed by the medical community as either the "yuppie flu" or a mysterious disease based largely on the imagination of neurotic depressed women. This has lead thousands of women on a quest to find a doctor, any doctor, that will listen to them when they say they are sick. A study recently published found the retrovirus in 67% of patients with Chronic Fatigue. Later on the researchers reported 95% of the patients tested positive with antibody testing. Also it was suggested that 10 million Americans may carry this recently discovered retrovirus. A veritable cornucopia of viruses. Chronic fatigue and Fibromyalgia have long been associated with all types of viruses including, Epstein-Barr, cytomegalovirus, Coxsackie viruses, echoviruses, enterviruses and parvovirus B19. From the very beginning it has been suspected that a retrovirus was involved. As early as 1986 an immunovirologist described retroviral activity in the cells of CFS patients but the actual virus wasn't described. Other viruses could still play a part but this is promising. More research will still need to be done to confirm the part that it plays in this illness and to understand the full effects of this virus in general. 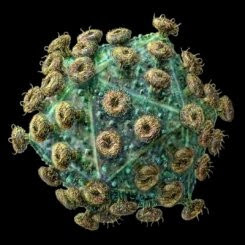 The virus leads to immune dysfunction by damaging an antiviral pathway in the body. Considering that Fibromyalgia and Chronic Fatigue have been described as autoimmune diseases it's very possible that the XMRV is responsible. I hope that the funding dollars will be there so that this valuable research can continue. Is it contagious? What can help? XMRV is thought to be transmitted through bodily fluids. That would make it infectious but genes and other predisposing factors appear to play a role in actually getting sick. Low dose naltrexone has been used in treatment with the retrovirus that causes AIDS. There are not a lot of side effects and has been used in the treatment of Chronic fatigue. After years of doctors saying that we're crazy maybe there now might just be an answer so Fibromyalgia and Chronic Fatigue will have the validation of the medical community at large. I have been looking for exactly this kind of information explaining about XMRV virus and its causes and effects. wow! i had no idea. so many doctors ridiculed me for my wastebasket ailment. making cruel comments about my weight, how inherently lazy i was, etc. damn. thnx for the info. good cheer to u.